INDUSTRY.co.id - Cianjur - On various occasions Minister of Agriculture of the Republic of Indonesia, Andi Amran Sulaiman gave a message that Indonesia will achieve self-sufficiency in garlic in 2021. The area of ​​land needed to achieve self-sufficiency is approximately 80 thousand Ha. To achieve the target, the Ministry through the Directorate General of Horticulture made a special effort by encouraging all potentials in the main garlic center areas to continue to develop and expand the center to self-sufficiency in garlic. According to Hasan, Head of Horticulture, Agriculture Department of Cianjur Regency, the potential of garlic development in Cianjur reaches 3,750 Ha spread in four districts, namely: Sukaresmi 1,000 Ha, Pacet 300 Ha, Sukanegara 1,700 Ha and Cugenang 750 Ha. Our location is at an altitude of 800 -1,200 above sea level with agroclimate conditions that are very suitable for the development of garlic. 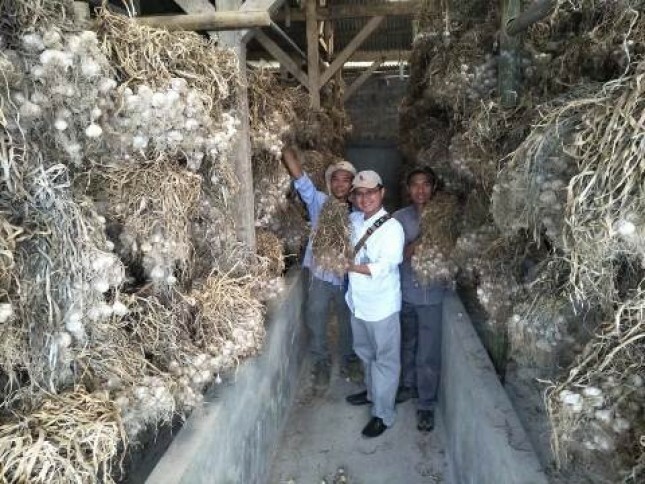 Cianjur is ready to become a new center as well as a buffer of national garlic seeds to be self-sufficient in garlic 2021, he said. Ajat Sudrajat, the garlic champion of Cianjur Regency explained that the farmers' groups are very enthusiastic in the development of garlic. This is evident from some of our farmer groups in Cugenang and Cipanas sub-districts doing self-help cultivation. Our group has planted a 5 Ha plantation on Tuesday, 10/07/2018 at Batu Lawang Village Cipanas District with Vice Regent Cianjur Mr. Herman Suherman, this proves that the local government is very concentrated in supporting the development of garlic in Cianjur. The same thing was added by Suhendar, Chairman of Gapoktan Mujagi Cipendawa Pacet Cipanas that we have done the cultivation of garlic Sangga Sembalun varieties and harvested with 5 Ha. The result is alhamdulillah can reach 7-8 tons / ha with intercropping system. From the beginning we intensely communicate with the agency and the BPSB of West Java for our crops are ready to be the seeds for our next planting. Currently we save seeds for the preparation of seeds and has been done certification process by BPSB West Java. We hope the group can become independent of the seeds as well as a buffer of West Java and even national territory because of our potential, he said. According to Agung Sunusi, Head of Sub Division of Red Onion and Bio-Vegetable of Directorate General of Horticulture, Cianjur, we will be encouraged to become a national seed center and buffer considering the large and strategic natural resources and human resources potential. We encourage the state budget in 2018 by providing seeds, saprodi and alsin to encourage farmers' groups to plant. Currently Cianjur continues to cultivate garlic with dominant varieties: Sembalun and Lumbuh Putih Sangga. To achieve self-sufficiency in garlic 2021, we also encourage Cianjur to partner with importers mandatory planting and production 5%. Currently there are 2 importers who are ready to cooperate and partner with farmer groups in Cianjur regency, who will certainly provide encouragement for the farmers in developing garlic in the region, he concluded.